If you’ll recall from our much earlier posts, one of the reasons why Pie and I showed such great interest in the new home community of Midtown during our house search is because of its close proximity to downtown Denver (about 6 miles if you were driving a direct route). There were plenty of new home communities to choose from further outside of Denver that might have been cheaper or offered even more square footage with bigger yards (Midtown was plenty big for us anyway), but only a couple were in our price range and within 10 miles of downtown Denver. Our biggest reason for wanting to be so close to downtown was because Pie and I are avid bicycle commuters. And when I say that we like biking, I don’t mean we just like to boast about it and then only bike maybe once or twice a month… I really mean that we live, eat, and breathe biking. We may not be speedy pros, but when the weather is good, we bike commute an average of 4-5 times a week. 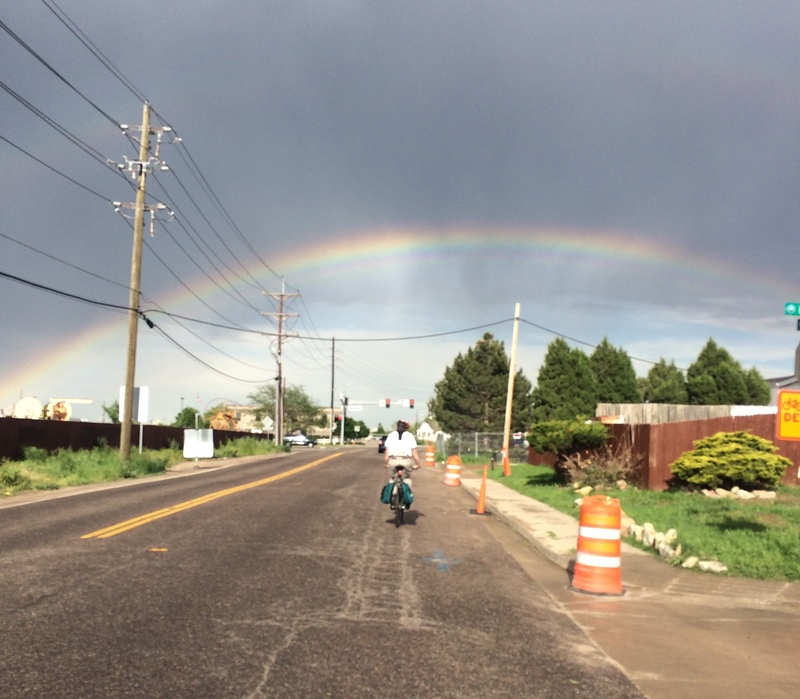 And heck, even when the weather is so-so, we are still commuting to work on two wheels about 4-5 times a week! We have gotten caught in rain, snow, hail storms, lightning storms, tornado warnings, wind that’ll knock you off your two feet wheels…you name it! One of Pie’s first objectives when we decided on Midtown — and while we were still months away from moving in — was to find a decent bike commuting route we could take from Midtown to downtown, where we both work. Although I had not biked the streets around Midtown as much as Pie, I had driven them often during our visits while the home was undergoing construction and I was very skeptical from the start that they would be suitable for a safe bike commute, but Pie kept insisting for months before we moved in that the bike route would not be too bad! It wasn’t until we actually moved in that I found out Pie’s optimism about the bike route was a little bit off. I hadn’t bothered to simply Google map the Midtown area to find the bicycle lanes/trails that would be around our new home until we were finally moved in. It turns out there are virtually no designated bike lanes anywhere around Midtown! 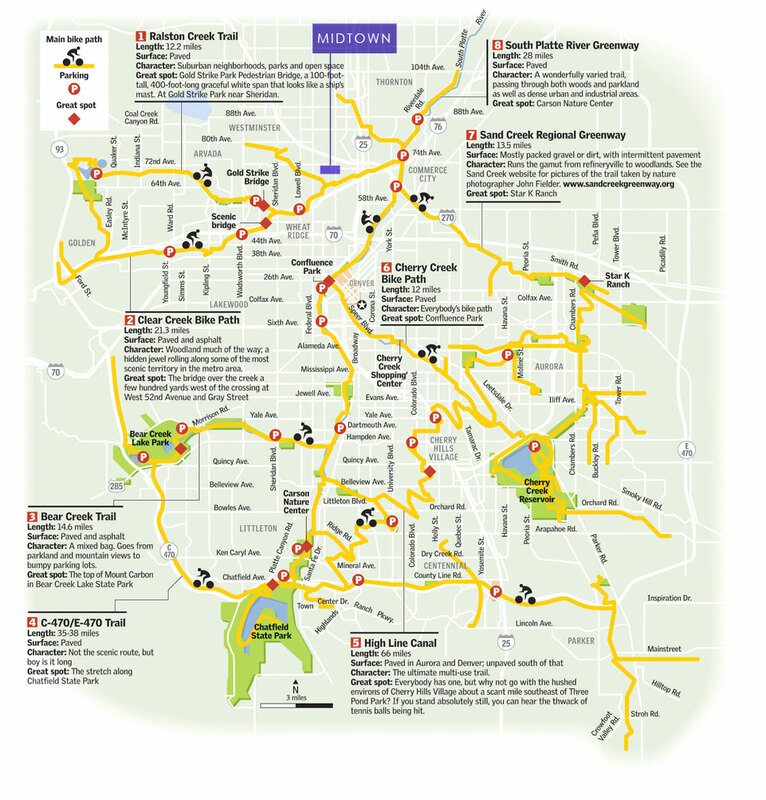 The map below from the Midtown website only illustrates river/creek/canal bike trails (and not necessarily bike friendly streets or roads with designated bike lanes), but it is still an accurate depiction of what is available for cyclists around Midtown, since there are actually no streets with bike lanes anyway. What you will notice immediately from the map below, is that the main option for bike commuting out of the Midtown community — the secluded bike trail — takes you far out of the way east and north of where you really want to be if you are heading to downtown. If you ignore the fact that this route will almost double your bike commute to 12 miles (compared to a direct route) and you’ll nearly gag to death when you have to pass several water treatment plants, a stinky animal farm, and a covered up landfill, this route is actually quite nice! 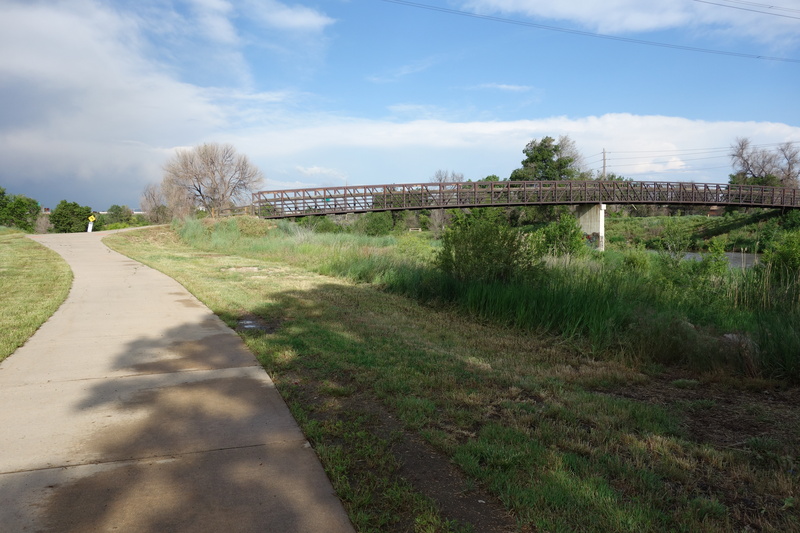 It goes along the Clear Creek and South Platte River trails the entire way, which are quite peaceful and so utterly beautiful in the spring and summer. If you’re lucky, you’ll even spot all kinds of wildlife on the way! Pie and I one time saw a turkey on this trail! One of the other things I appreciated about this route early on (besides the obvious fact that you don’t have to share your commute with four- and 16-wheeled vehicles) was that it wasn’t as confusing as zigzagging through residential streets and busy roads; you just get on the bike path and ride… and ride and ride! 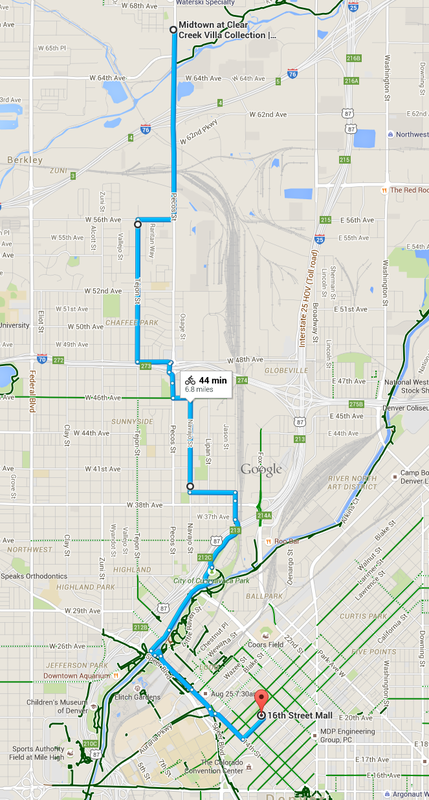 At a comfort riding pace of 12 mph, this route typically takes us about an hour to complete. 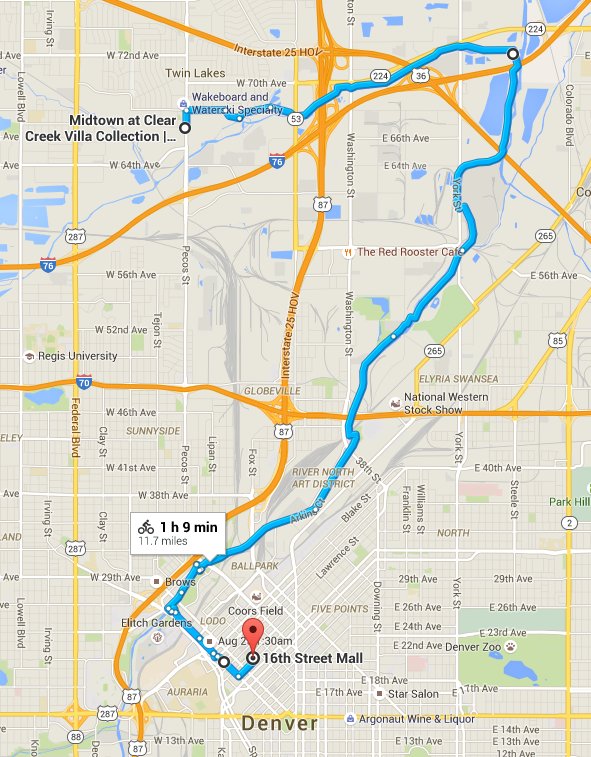 To bike this route, you can get on the Clear Creek Trail at two different trailheads near Midtown. 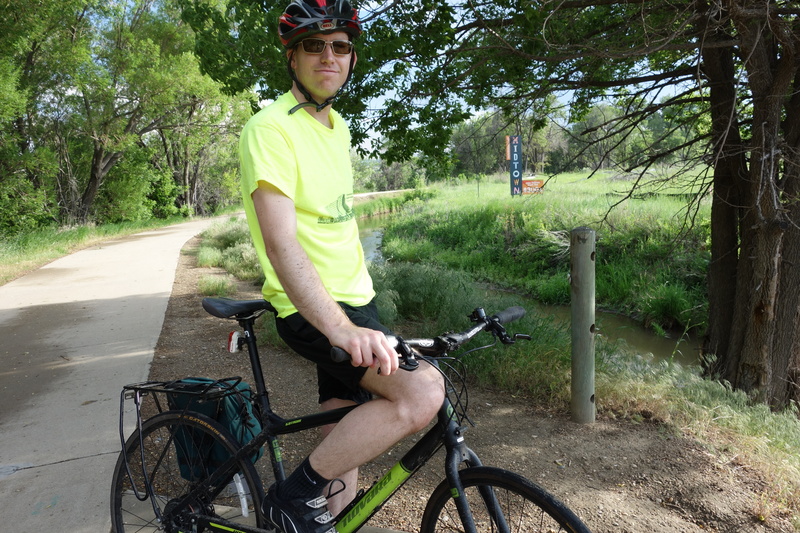 If you get on the trail at 68th and Santa Fe, you will start your ride with some beautiful scenery to your left — a lush, swampy creek! You’ll then quickly come to a bridge where you need to turn left. Before you turn left on the bridge, take a quick peek to the right to see the super cute “Midtown” sign on the edge of the meadow! Don’t know why they decided to hide this adorable sign out here! If you get on a Pecos & 64th, you will just need to continue going straight once you pass this Midtown sign (it’ll be on your left coming from this direction). 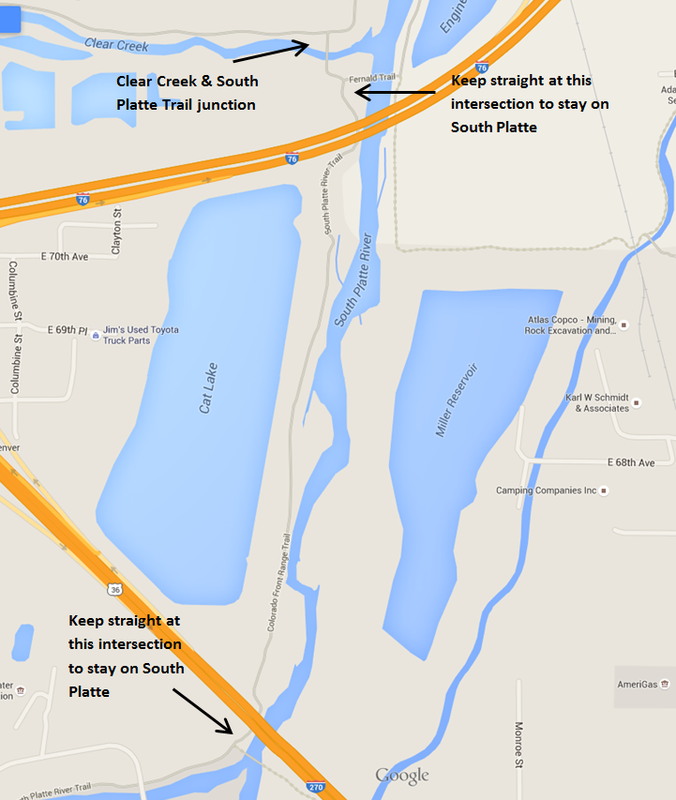 The Clear Creek Trail will take you northeast and eventually run into a big, long bridge that takes you to the South Platte River Trail. Turn right at this big bridge and you’ll see bathrooms on the other side of this bridge. 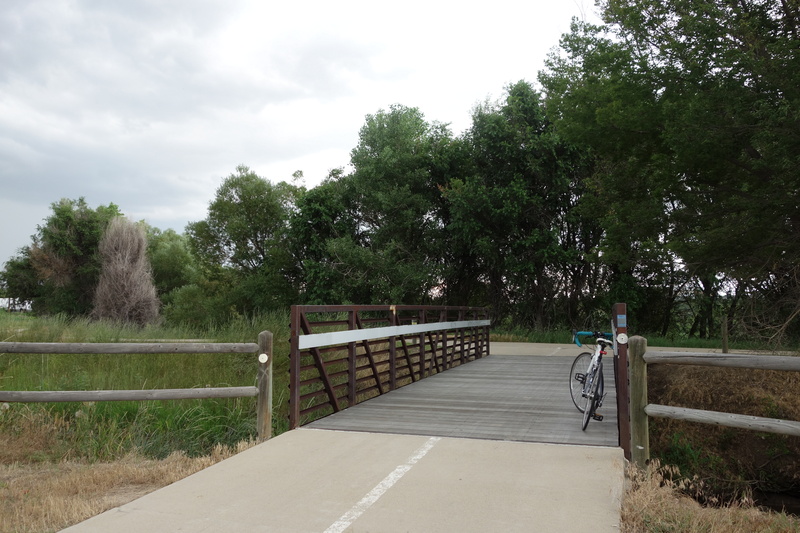 The rest of the route continues south on the South Platte River Trail. 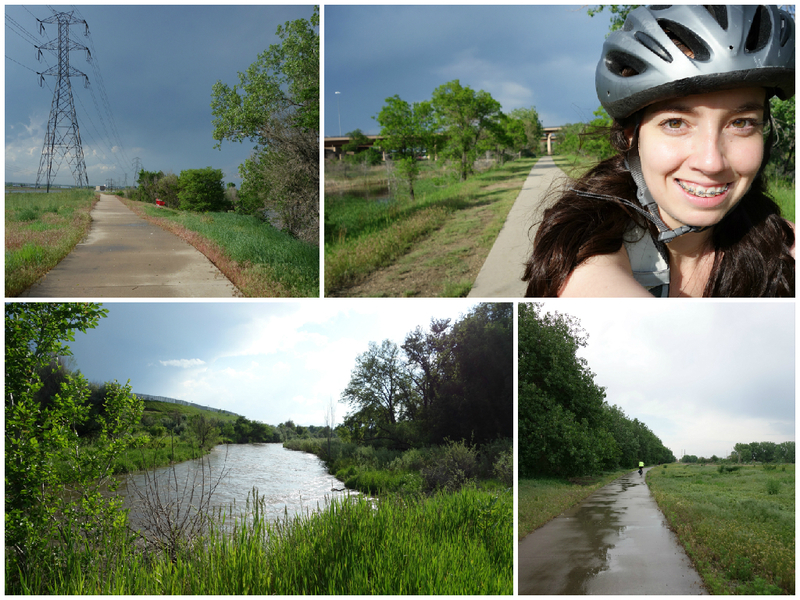 There may be some detours due to high water, but overall, the ride is very serene. If you’re directionally-challenged like me, you might be a little confused when you get to two particular sections that seem like forks in the road, but aren’t! Just continue heading southwest and enjoy the scenery! Heck, take a biking selfie while you’re at it! If you work in the northern area of downtown, it’s best to get off the bike path at the City of Cuernavaca Park. This will shoot you out at 20th and Little Raven, with 20th Street and 19th Street being good channels to get to where you need to be downtown. 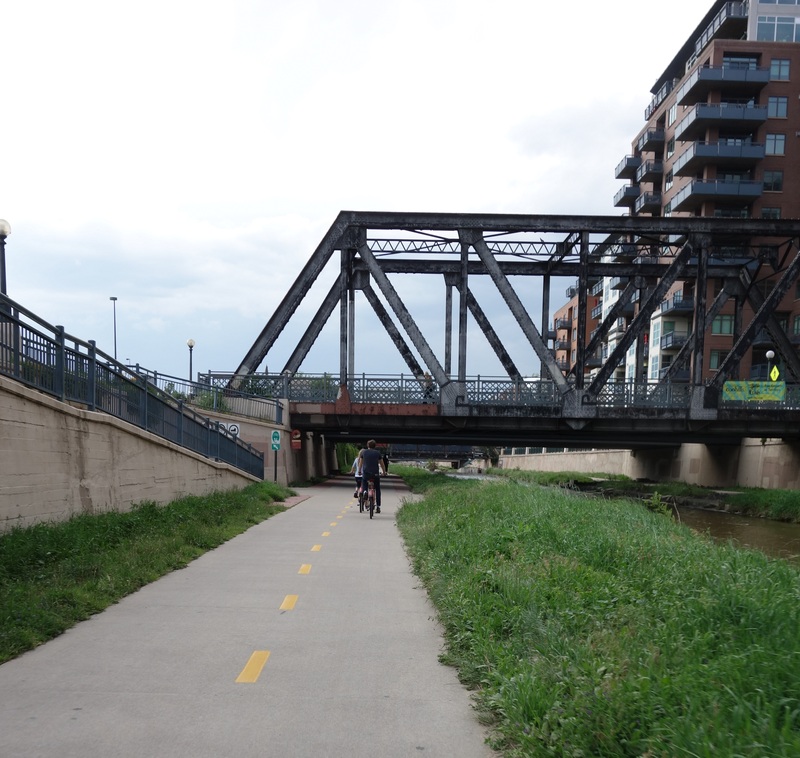 The South Platte River Trail eventually intersects into the Cherry Creek Trail at Confluence Park. 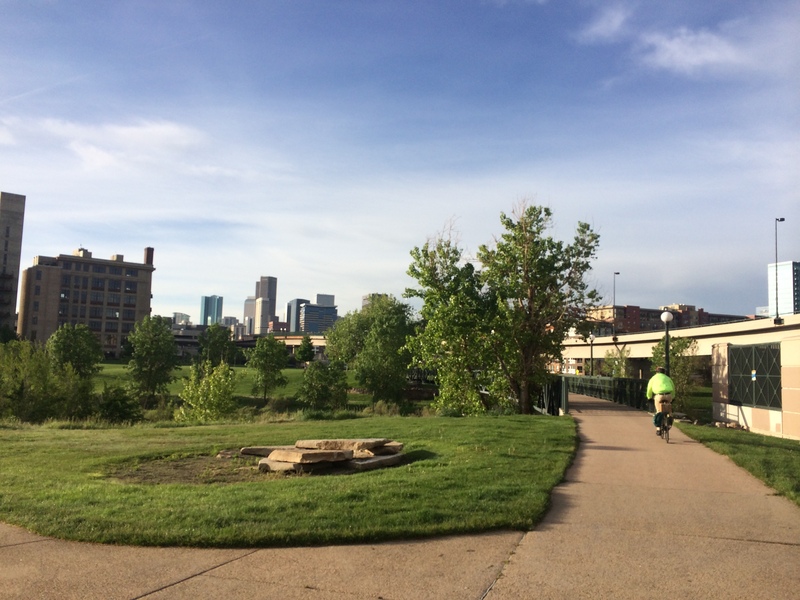 If you work on the southern end of downtown, it’s best to jump onto the Cherry Creek Trail at Confluence Park and hop off Cherry Creek on one of the many bike path entrance/exit ramps to get to where you need to be downtown. 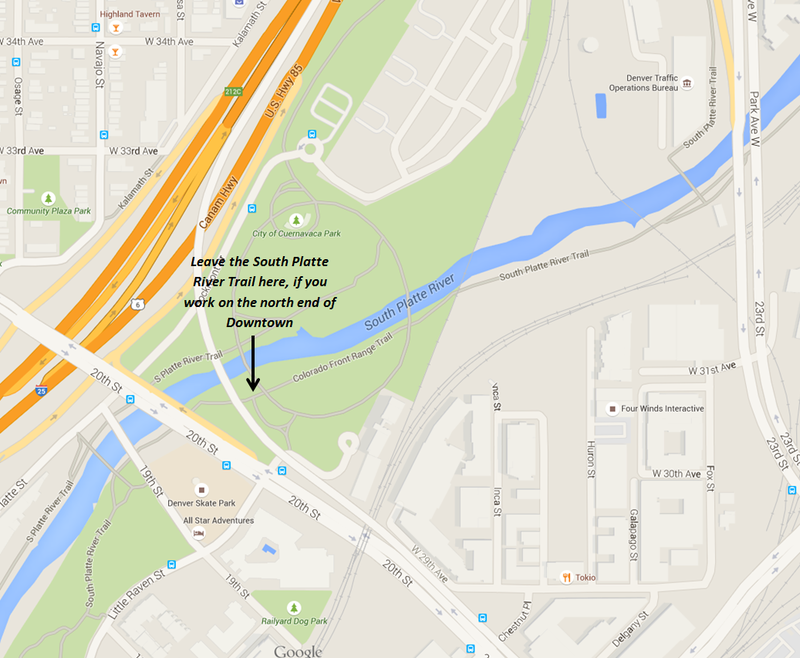 There is currently a lot of construction and flooding in the Confluence Park area, so follow the detours carefully! 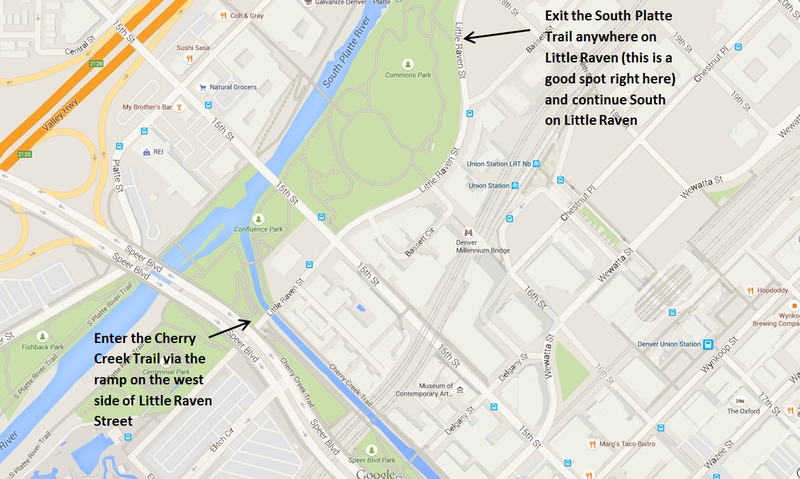 To avoid getting lost in the detours, skip the Confluence Park area completely and stay on Little Raven from 15th to Speer. The second, less desirable (IMO) and less safe option for biking to downtown from Midtown is using the streets to take a more direct route.This route requires venturing for a short stretch onto the nearest main street (Pecos) that runs north and south. On the bright side, this route is more direct and when you’re in a hurry (or trying to spend as least amount of time in a rain- or snowstorm), you can get to and from work in about 30-40 minutes. 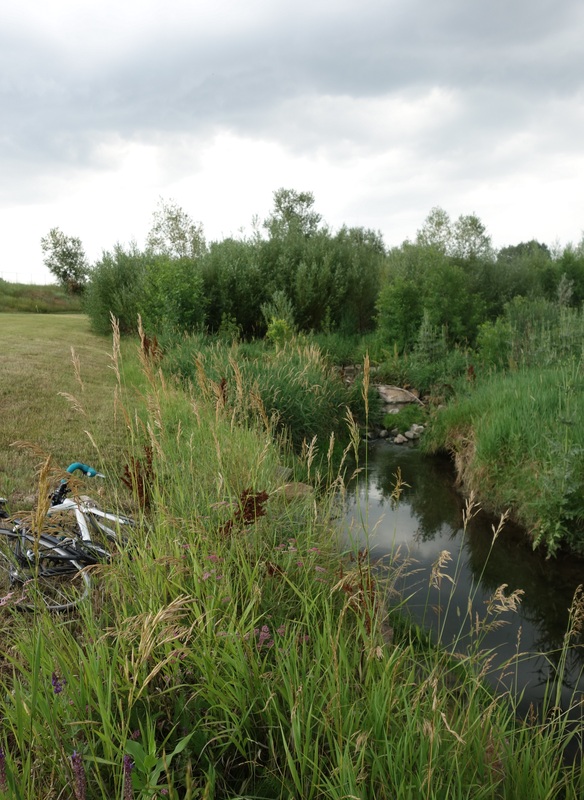 To bike this route, it’s pretty simple to start! Just start heading south on Pecos! Hubby and I prefer to use the sidewalk because there is no bike lane on Pecos and there are way too many vehicles on this road for our liking, but we have seen plenty of ballsy cyclists riding on this busy street. However, I would have to point out that the sidewalk isn’t very ideal either. Generally, when biking, it’s a good idea to use the street when you can because motorists sometimes don’t notice pedestrians and cyclists crossing an intersection from a sidewalk (even if a crosswalk is present and you have the little white “walkman”), so you really have to be careful for motorists turning right and left when you are riding on a sidewalk and crossing an intersection or driveway (ok, I sound like your mom here, but it’s true!). The other problem with riding on the sidewalks near Pecos is the amount of dirt and debris. If you ride a road bike with skinny tires, it’s easy to slip on this debris if you need to make a turn or have to brake suddenly. After riding over the large bridge that goes over the train tracks (it’s quite a hill, so be prepared to sweat!) 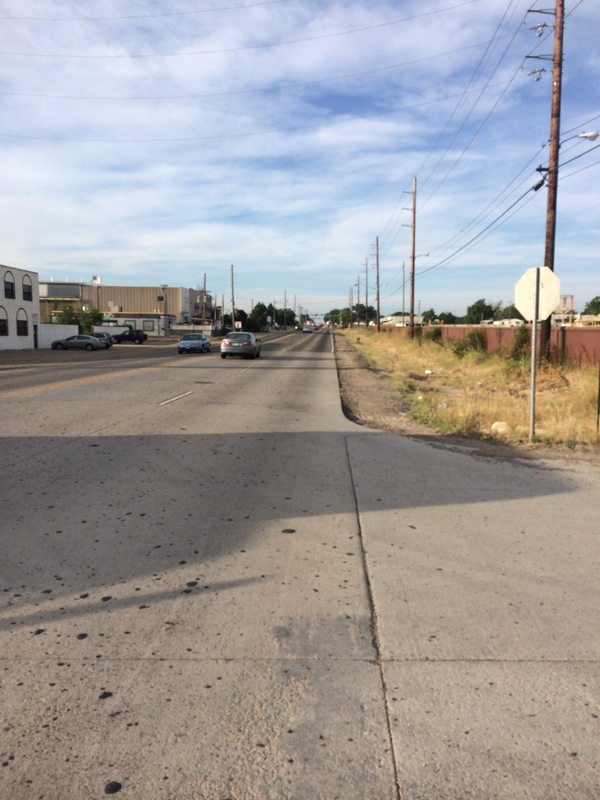 south of I-76, you will come to a section of Pecos that does not have a sidewalk. You are forced to ride on the road here and it is advisable to “take the lane” in the right turn lane and then turn right at 56th Avenue. While we have seen many cyclists travel all the way down Pecos instead of turning on 56th Avenue, hubby and I prefer to use the residential streets when we can. 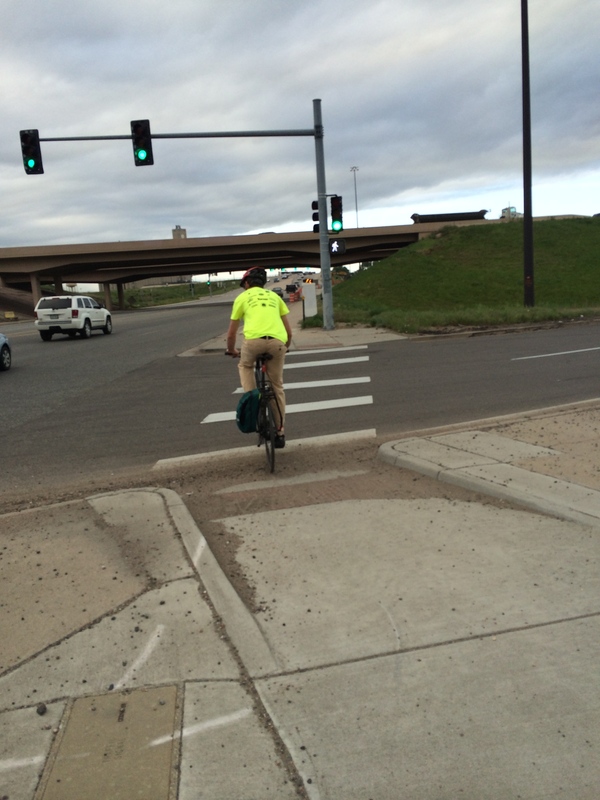 The rest of Pecos Street all the way down to I-70 is not bike-laned either and has heavy traffic. 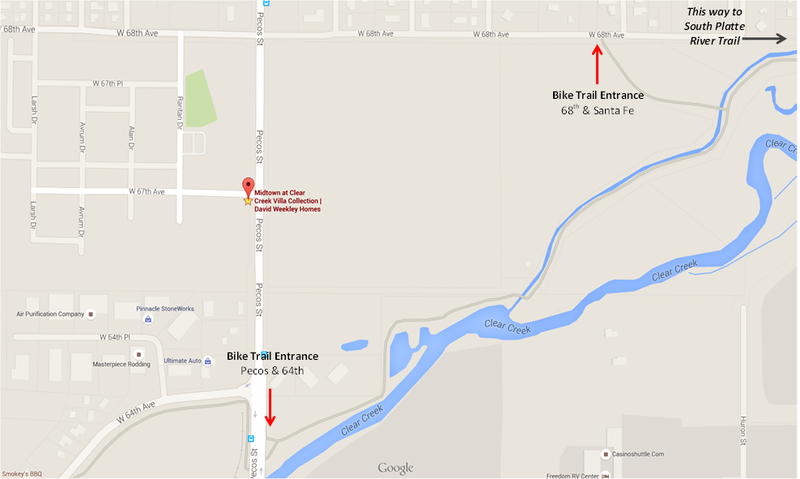 You will continue only a few blocks out of the way on 56th Avenue and turn left on Tejon. Tejon is the first residential street that is a straight shot south to I-70. 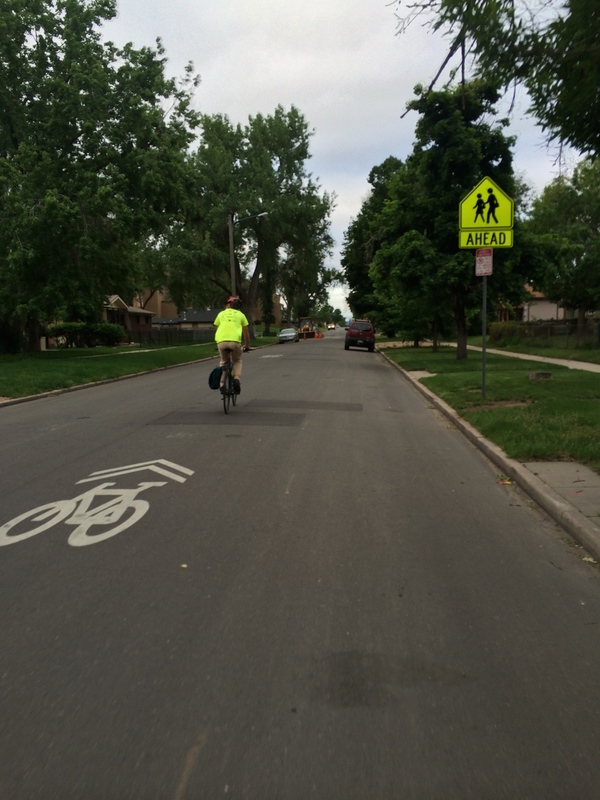 The ride down Tejon is one of the few sections of this commute that is peaceful and smooth. Enjoy it! Tejon cuts off at I-70 and here you will turn left and come the roundabout at I-70 at Pecos. Although the roundabout is a bit of a pain with all the car traffic, you don’t have to merge with the crazy traffic because there is a section on the west side that includes a bridge for pedestrians/cyclists only. You will again have to be very careful here as vehicles do not seem to stop for pedestrians or bicyclists crossing the roundabout on the crosswalks and it often becomes a game of frogger knowing when to cross each crosswalk. 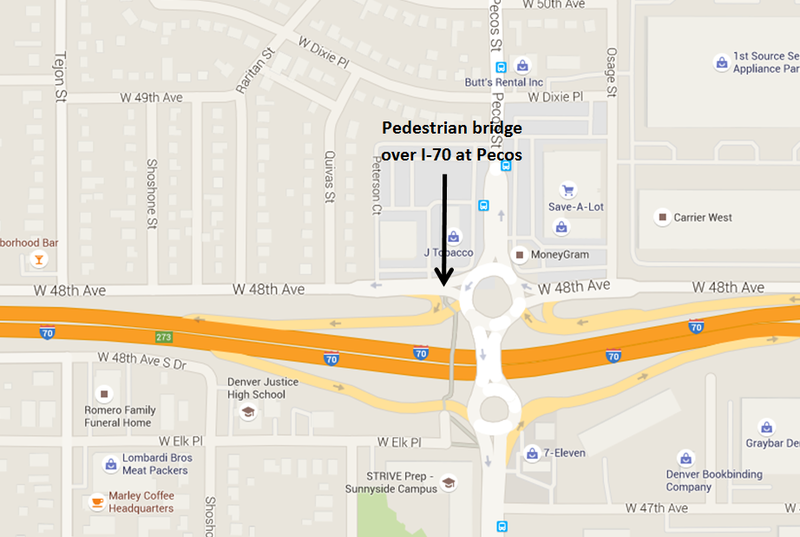 After getting through the two roundabouts at I-70 and Pecos you will continue south down Pecos on the sidewalk. This isn’t an ideal section either, as the sidewalk is very narrow and often has pedestrians walking smack-dab in the middle of the sidewalk (with headphones on of course, so they can’t hear you). And the street only has one lane each way, so it’s not ideal to be on the street either. Hubby and I take the sidewalk a couple of blocks down Pecos to 46th Avenue and turn left at 46th Avenue. From 46th Avenue, we turn right on Navajo. Navajo does not have a dedicated bike lane, but it does have the “bicycle stamps” on the road, indicating to drivers that they should expect and look out for bicyclists on this road. This road is not busy, but it’s a good idea to be careful for people parked along the road that may open their car doors without looking. From Navajo, turn left on 40th and jump over several streets until you dead-end at Inca. Inca is possibly the worst street you will ever have to bike on in your entire life because of how torn up the road is, but at the very least, it only lasts for one block and you get a brief view of the incredible downtown skyline that is hard to beat! 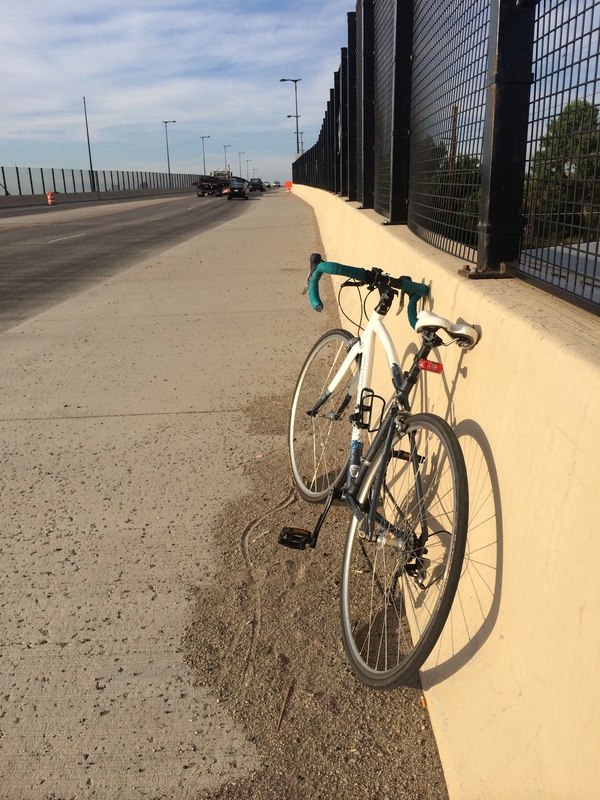 Inca crosses over 38th Avenue, via a convenient, little concrete bridge. After crossing this bridge, you continue on the bike path (wohoo! a bike path!!!) and travel under I-25. 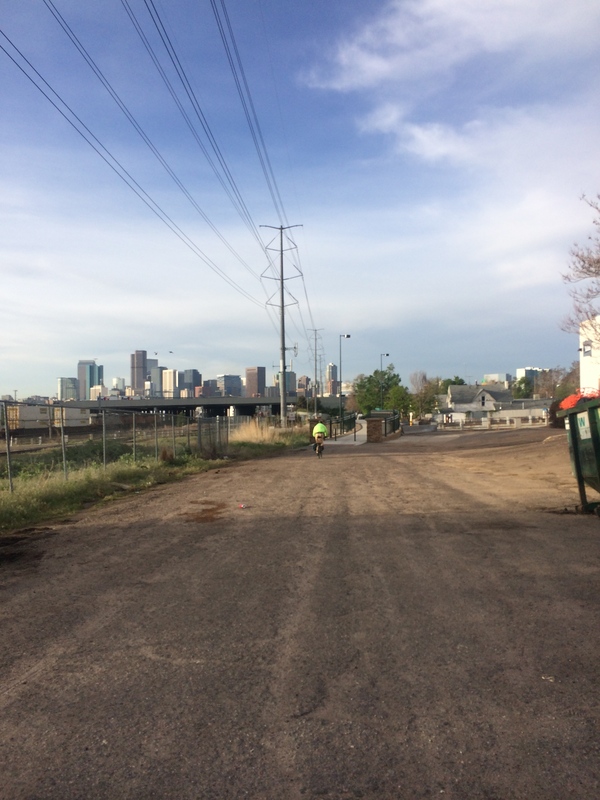 This bike path eventually ends up the City of Cuernavaca Park and the South Platte River Trail. 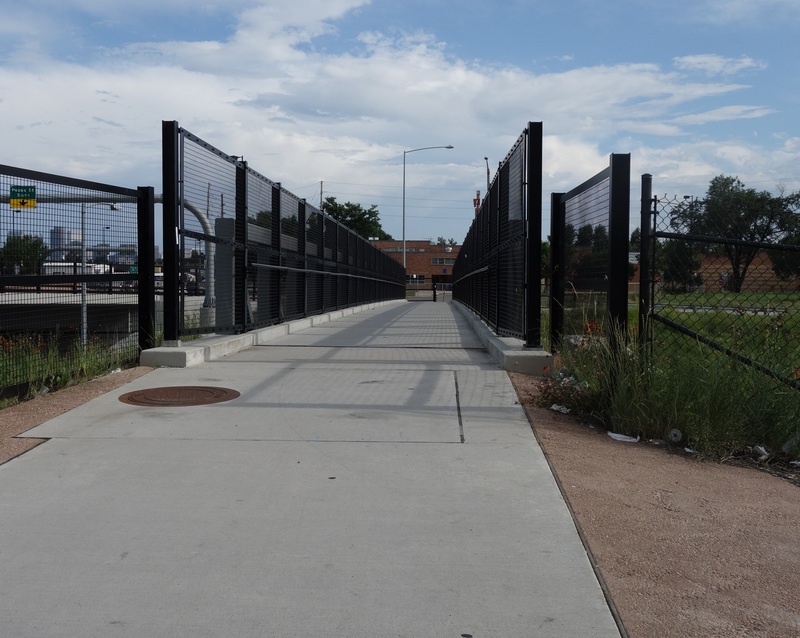 After passing a big bridge over the South Platte River, you can either break off at 20th & Little Raven to get to northern downtown or get on the South Platte River Trail and continue to the Cherry Creek Trail to get to southern downtown (as mentioned above).